Flexible UV-Printing System Enables Simple, High Quality In-Line Printing on all Types Of Webs. 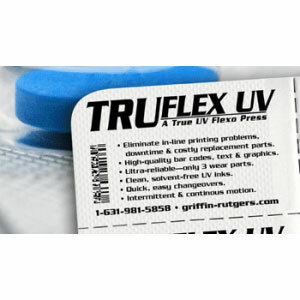 Griffin-Rutgers is proud to announce the availability of our TRUFLEX UV, A True UV Flexographic Printing Press. This printing unit offers high quality, precisely positioned in-line printing on all types of web materials. TRUFLEX UV operates in the true rotary flexo-printing method, offering ease-of-use along with low operating and maintenance costs. The simple design of TRUFLEX UV provides for the highest quality printing from large solid areas to small details, including all bar code symbologies. Special solvent–free UV inks are employed that cure in milliseconds when exposed to the integrated UV curing system. The use of UV inks means no cleaning over a production run as well as simple set up and shut down procedures. TRUFLEX UV can be integrated with either continuous or intermittent motion packaging lines and in most cases will have an excess in speed capacity of over 50%. Additional features of this unit include an easy exchange of print cylinders – no tools required – allowing for short changeover times and the use of ozone-free UV bulbs. A registration control feature enables additional information to be printed onto pre-printed webs. The precision index feature provides for the matching of the print to the exact index required. Griffin-Rutgers’ services include needs assessment, technical coordination with upstream or downstream equipment, product delivery, installation, setup, training, spare parts and consumables.